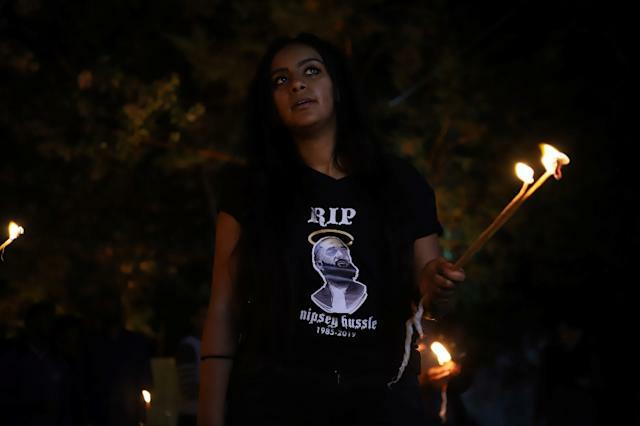 Addis Ababa (AFP) - With poems and speeches, Ethiopians have held an emotional farewell for murdered rapper Nipsey Hussle, whose roots in neighbouring Eritrea won him admirers in both countries. "When we heard there's an Eritrean rapper out there, we were fans before we heard his music," said Ambaye Michael Tesfay, who eulogised Hussle at the event held in a darkened parking lot. "He was an icon for us." Before his 2018 debut album "Victory Lap" scored a Grammy nomination for Best Rap Album, Hussle, born Ermias Asghedom, had won the attention of rap fans from both Ethiopia and Eritrea for his embrace of his father's Eritrean heritage. "It's just really tragic what happened," said Tezeta Solomon, an Ethiopian living in Los Angeles who attended the memorial in Addis Ababa. "When he first came out, we were all so excited. To know there was a habesha rapper out there definitely sparked some pride," she said, using a common term to describe people from the Horn of Africa. Hussle embraced his Eritrean heritage, visiting the country last year and telling state media, "More than anything I am proud of being Eritrean." The frosty relations did little to dampen Ethiopians' pride in Hussle's success. "We're all one people," said Nemany Hailemelekot, an organiser of the memorial.